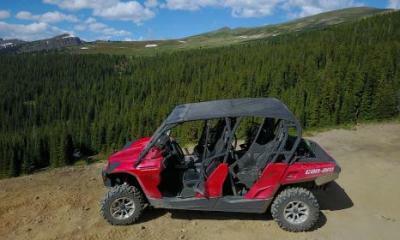 Experience the Winter Park, Colorado backcountry area by going off roading on a razr or side by side tour or rental. The mountains of Winter Park, Colorado and the area are a photographers dream, see amazing views, and experience wildlife. Our outfitters know the Colorado backcountry and pride themselves in making sure that each guest has a memorable mountain experience. Or wonder out alone and create your own Winter Park area off road experience. Snowmobile to the top of the world! Grand Lake Colorado's only ATV and snowmobile rental located on the trail!